We had an awesome time on our fishing trips. Both Jim and Russell were excellent guides and uniquely qualified in both their regions. We would highly recommend them to anyone! A special thank you for all your help in organizing our trip. The accommodations were great and very convenient. We will be back in the future and will look forward to working with you again for another adventure!! Thank you for looking after us all so well, your attention to detail, and your knowledge of the Scottish Salmon fishing opportunities, was,- we found, - second to none !! Every good wish for the continued success, of SFHS, with just enough time to allow you both to do some fishing as well !! I hope to return in the not too distant future. I would like to thank you so very much for what was the most amazing, relaxing and inspirational week I had on the River Tay chasing the spring run. From the second I made contact with Salmon Fishing Holidays Scotland, with detailed correspondence leading up to the big week, the week could not have flowed any better. The transfer from the airport and hotel to the fishing venues, the ghillie’s and the amazing lunches, were all truly top quality. Samantha’s and Silja advice about the river, terminal tackle and casting, has improved my fishing and confidence incredibly. I plan on returning back to Scotland very shortly. I just wanted to thank you Samantha and your team, for the very good organisation of our four-day corporate trip on the River Tay. Every aspect of our trip, from accommodation to transfers was perfect and for everybody a great experience and wonderful days in Scotland. SFHS provided our party with a professional service throughout for our booking. With excellent information in regards to the beat, ghillie and also a map/plan of how to actually get there (which was definitely needed). I certainly recommend their services if you want a highly professional, unique salmon fishing experience. I purchased a voucher for a day’s guided salmon fishing with lunch for my husbands Christmas. I was very impressed with the service, from ordering the voucher to his experience on the day. Samantha kept in touch with me and even enquired about what he liked to eat and drink! My husband was picked up in an immaculate 4x4 vehicle and was very well looked after. He enjoyed his day fishing, ending with a visit to the Inn to share the tales of "the one that got away"! Great service and would definitely recommend SFHS. I would like to say thanks to Samantha and Sandy for organising a perfect week’s springer fishing on Tulchan. After booking four rods last autumn on another beat the owner cancelled (!!) our booking mid-January but Samantha and Sandy responded immediately, putting their excellent connections into play so that we ended up on Tulchan. Top job! (Top Beat) Summing up these guys run a highly professional, excellently networked family business with a little bit of extra – called personal touch. SFHS is a 5-star company for 5-star fishing breaks. I can highly recommend them. Samantha & Sandy are lovely people. Last summer my girlfriend and I were there for one week. We had a lot of fun! We liked Samantha’s lunch, O man… she gives you the full package. My girlfriend was struggling with her casting and Samantha decided to take her to one side on the second night and give her some guidance even though this wasn’t a guided trip. This really helped Amanda as then she had the confidence to fish the rest of the week. I can highly recommend this fishing trip to everyone. Thanks guys for the lovely week. We are still floating from such an amazing holiday. The accommodation was 5 star, from the attentive staff, to the mouthwatering food & wine. Our salmon fishing with our guide Jimmy was excellent and we thoroughly enjoyed every minute. Such stunning autumn colours. We have already decided to return. Thank you for making our wildest dreams possible. Thank you SFHS! Our weekend was absolutely perfect in every way. Andrew has referred to it as a weekend from his wildest dreams and we both thoroughly enjoyed. The accommodation was outstanding and Andy was the perfect guide. He even shared a glass of red wine with me at the end of the 2nd day that he had tucked away in his hut!! I would not hesitate to recommend SFHS to anyone. Your help and guidance has been thorough and prompt from day one. Thank you for helping me plan such a special and perfect weekend, I could never have done it without you! Just a final note to express our appreciation to you and Sandy for a job well done! "I have booked twice with Sam & Sandy, both times were thoroughly enjoyable. I received a personal yet professional service, some great advice and furthermore gained two valuable friends. I highly recommend booking with these guys, they have a real passion for angling and cook a pretty good burger!!" Clouds, Wind and Fishssss !! "Just three days with Samantha and Sandy. Trouts and salmons fishing. Everything was perfect! Tranfers, advices, accommodation ... And as says Sandy for trouts fly fishing : "CWF" Clouds, Wind and Fishssss ! !Thanks a lot"
"As a relative novice to salmon fishing I was keen to expand my knowledge and it was suggested that I look at Scottish salmon Fishing Surgery website. I found it really useful and still do. I subsequently met Sandy and Sam and found their enthusiasm and passion for salmon fishing to be infectious. They are a lovely couple and I would urge anyone thinking about using their services to do so." 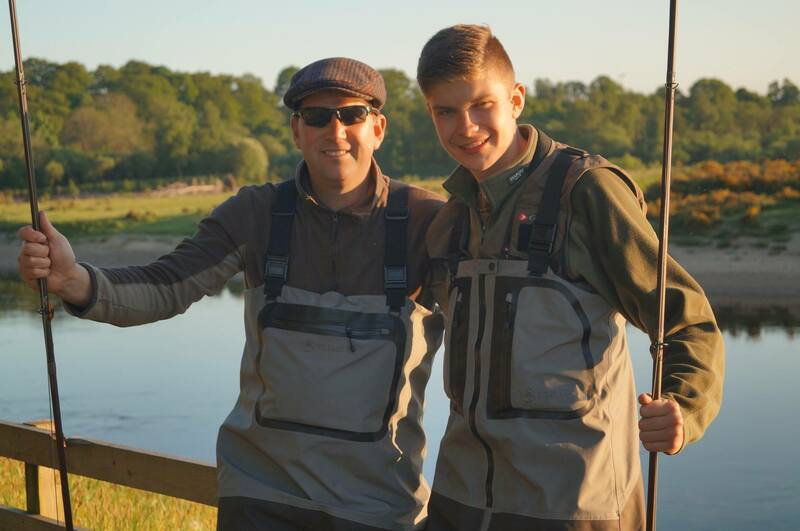 "I had an experience of a lifetime when I booked my salmon fishing holiday with SFHS. The SFHS team delivered on everything that they promised and more. Cannot wait for my next salmon fishing foray." "Great food, great Scottish hospitality and above all great salmon fishing. Thank you,​ SFHS." "As being a relative novice to salmon fishing, SFHS took care of all my requirements. Their customer service was second to none as was their tuition. The SFHS guides were so patient and made me feel at ease immediately. I finally managed to get my salmon rod bent. Definitely hooked for life!" Big 4 in 4 challenge next year! "Excellent fishing guides with unrivalled knowledge. It is a day's salmon fishing that will be firmly etched in my memory forever. Looking forward to attempting the SFHS “ Big 4 in 4” challenge next year." Prove your not a bot. What is 11 + 7?